There is a big misconception about web design. A great web design is not an out of this world design made by an award winning creative agency, but it is a design made by professionals who are knowledgeable about user experience (UX) and creates a design to attract and engage the largest, widest number of visitors from different backgrounds, ages, etc... A website that works is a website where the menu is located where most visitors expect to find it. Let's be realistic, our clients have a website to make money. This being said, to produce any income a website should be designed by professionals, yet the owner of the website, or someone in his/her team, should be able to manage it and make any changes at will. For that reason, we have tried all the open source CMS platforms. WHAT IS A CMS AND WHY ARE WE USING ONE? With most of our developers/programmers preferring .NET we chose to build websites on DNN and Umbraco, both CMS built on the Microsoft .NET framework. DNN’s ease of use for our clients made it our preferred choice for developing additional applications. DNN average learning curve for our clients to be able to do some changes, create new pages, upload images and video is under 2 hours of training. Dotnetnuke (DNN) works a bit like building Legos with blocks called “modules”. Each module has a function, some of them are for editing and others are for management or online sales making it ideal for scalable business websites. We started to develop custom applications for almost anything and in any industry granting our clients accessibility to their data anytime and anywhere. As web designers, we translate our client's vision into a user-friendly web design focused on aesthetics and UX (user experience). As developers, we build engaging websites with online tools that our clients can use to market their products and services. 90% of the people you want to do business with will check your website first and while looks are important it is engaging features that are crucial to your business. We design stylish, eye-catching, responsive websites that have engaging business features built on the best standalone .NET/CMS* platform. Unlike DIY hosted solutions such as Godaddy, Yahoo, Shopify or mass produced by WordPress developers, we are fully dedicated to each of our clients' projects by building them custom online business applications. For some of us working in web design and development for more than two decades we are often tempted to tell our clients to leave the concept, design and development of their website to us the professionals. And for few of the project we have worked on it should have been better but for the majority of the case we like to involve the clients and their team, mostly the ones that have a clear idea about their branding. We like to start by understanding our new client’s needs and the goals they want to attain with the new website. Will the future website be an Ecommerce, a real estate website, an engineering website with project management system and projects portfolio or an all-in-one business process management solution... We also need to learn our new client’s ideas about color charts, content, photos, website inspiration, etc. MULTI-CULTURAL ADVANTAGE - THE "WOW" FACTOR. Although all our projects are steered by a seasoned web architect or team leader, our young multicultural team of designers are responsible for creative input and making each project a one of a kind website. Our web designers Stephanie, Nathalie, Thierry and Alex have respectively studied at the Art Institute of Fort Lauderdale (FL), Design and Architecture Senior High (FL) and the Nice Art Deco (France). 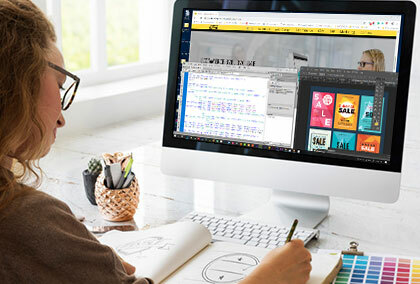 Although they are young web designers they have accumulated more than 10 years of experience in the web design field with a multicultural approach (American, Latin, European and Asian). Working with major fashion, perfume, cosmetics and entertainment companies has given the team a serious advantage in designing trendy websites with a “WOW” factor. There are so many ads for DIY free web builder solutions and so many emails from freelancers doing websites for small businesses with WordPress or GoDaddy for $500. Do you seriously believe that Angelina Jolie created the website for her beauty line on Wix? There is no such thing as a website designed for small businesses because a business website should be scalable. If it is designed on an outdated technology good luck making it grow with your business and making money with it. Our scalable and intelligent business CMS website packages start at $1950.